Looking for a place to go for your special day? Look no further than these amazing destinations in Asia. Update November 2018: Unfortunately Pan Pacific Nirwana has closed it’s doors permanently. The Island of the Gods is a great place to go for your special day. With gorgeous beaches, beautiful sunsets, hipster cafes and lots of natural attractions to explore, the island caters to all types of travellers, from the adventurous to those seeking serenity. 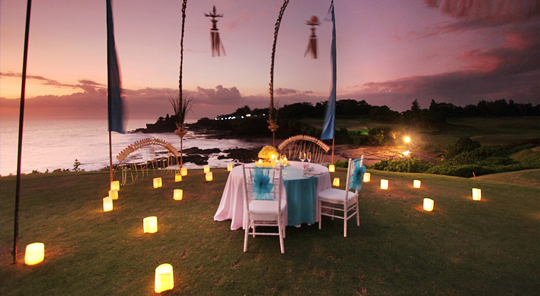 Head to the Pan Pacific Nirwana Bali Resort for a luxurious and romantic stay. Dine by candlelight as the sun sets, and have your meal under the stars, overlooking the beach and the island’s natural cliffs. The resort even lets you customise your menu with a personal chef and a butler service. With attractions like the opulent Royal Palace and famous Mekong Delta, Cambodia is on many travellers’ bucket list. 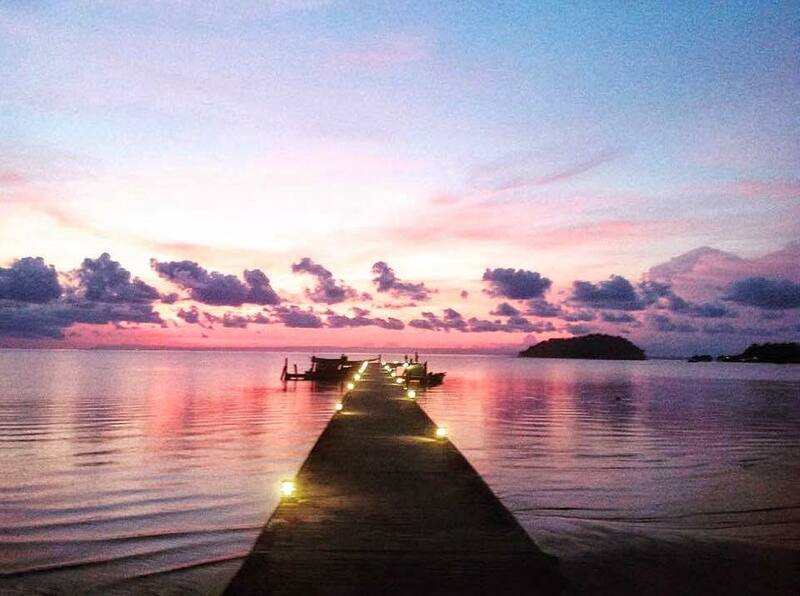 But unlike a regular traveller, make your trip a little more special by heading to the private islands of Song Saa. Located in the untouched Koh Rong Archipelago, Song Saa consists of two pristine islands, whose name in Khmer means ‘The Sweethearts’. 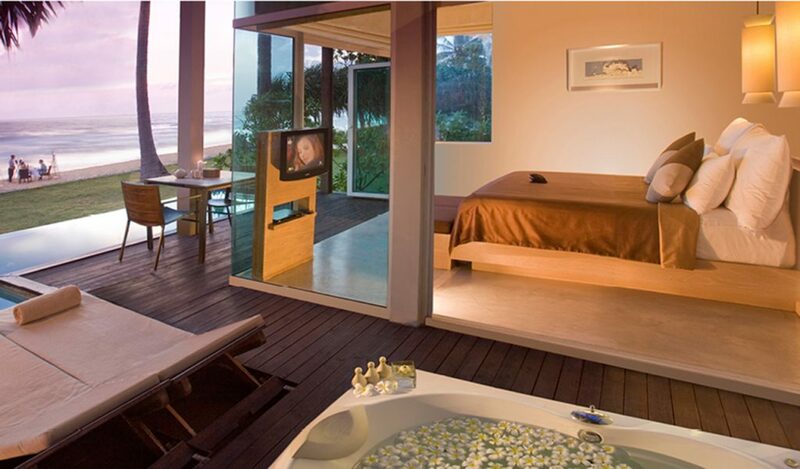 A stay at the Song Saa Private Island resort will give you an intimate experience, with your loved one and with nature. Journey through rainforests, swim through the tropical reefs, and walk barefoot on the soft white sand with your partner and be amazed by the untouched nature there. A popular tourist destination, Phuket boasts some of Thailand’s most visited beaches, with countless resorts and spas by the coast. For those looking for a tropical paradise to go to for an outdoor wedding by the beach or a tropical honeymoon, Phuket could be your answer. Aleenta Phuket Resort has your wedding needs covered, even providing you with personal wedding planners in anticipation for your big day. The resort also has gorgeous beachfront pool suites, with retractable glass walls that give you full view of the Andaman Sea, a private pool, a private Jacuzzi and a beach terrace as well. 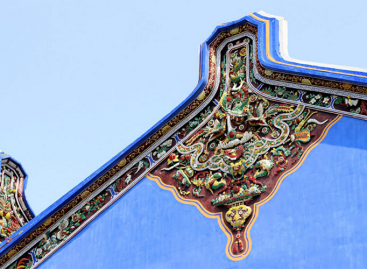 From pagodas to world war relics and bustling cityscapes, Vietnam has plenty to offer to travellers. It wouldn’t hurt to explore some of the country’s attractions before you retreat to a peaceful resort to celebrate your wedding or honeymoon! Six Senses at Ninh Van Bay is the perfect tranquil retreat for you and your partner. Book a villa on the rocks (yes, really) and have one of the most unique vacations ever. Their rock pool villas are set atop the rocks overlooking the waters of Ninh Van Bay– the best vantage point from which to admire or to take pictures with the sunset. An island south of India, Sri Lanka has everything from rainforests to highlands to beaches. While it doesn’t seem as popular a travel spot as its other Southeast Asian neighbours, it has no lack of attractions to offer. For a memorable honeymoon or wedding, retreat into nature at Jetwing Hotels. The eco-luxury resort is set in the midst of reef beds and paddy fields, and has been named the Best Eco Luxury Hotel in Sri Lanka by Harper’s Bazaar. They have a Honeymoon Offer that comes with a 5 course meal and a bottle of wine. Jetwing House II, 46/26, Navam Mawatha, Colombo 02, 00200, Sri Lanka. What better way to commemorate your special day than with a hike up one of the most famed mountains in the world? Well, if mountain climbing isn’t your romantic activity of choice, how about admiring the view of Mt. 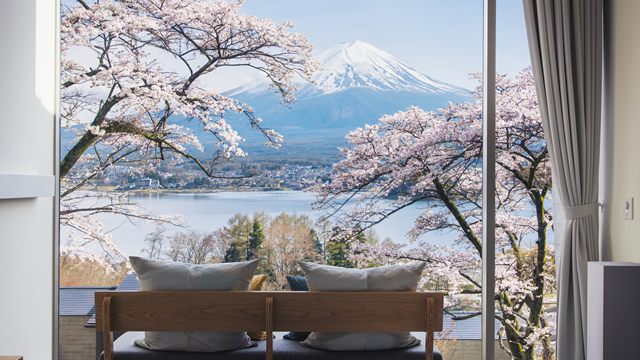 Fuji while resting with your partner at a luxurious resort on a hill? That’s what Hoshinoya offers: a glamping experience on a hill near Mt. Fuji. At this glamping resort, you’ll experience all the benefits of staying close to nature without having to deal with the troubles of traditional camping as amenities are all taken care of for you. While the city areas are known for shopping and eating spots, South Korea’s Jeju Island is a serene paradise overlooking the ocean. Apart from being a fantastic spot to explore nature, it is also the country’s top honeymoon destination for Koreans. Take a break from the city at The Shilla Jeju, where you can have a romantic time with your partner after exploring the island’s caves and volcanic landscapes. Newlyweds typically prefer their Pacific Deluxe suite, where you can admire views of the sea from the bathtub and jacuzzi. The Maldives have long had a reputation of being a tropical paradise, and many people dream of a stay at one of their overwater villas overlooking turquoise lagoons, which are a perfect spot for newlyweds and soon-to-be-married couples. 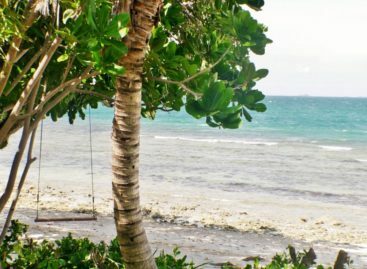 And it does not have to be a break-the-bank honeymoon, you can also visit the Maldives on a budget. For a splurge, W Maldives offers a private island stay at this dreamy vacation spot, with pristine beaches and fascinating marine life, complete with top-class service. 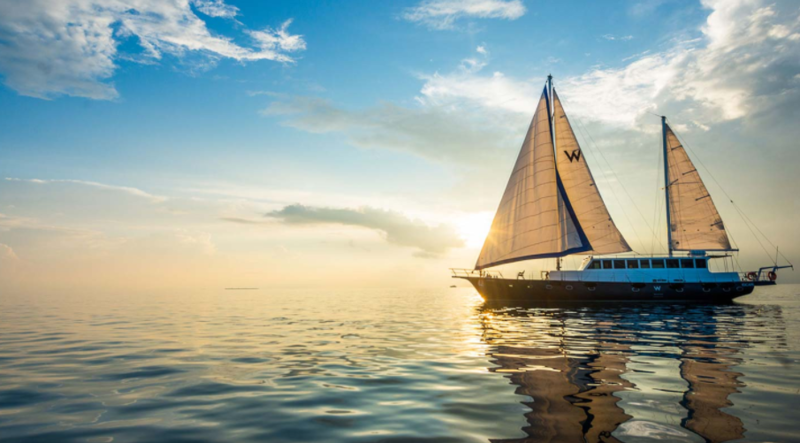 Whether you’re jumping into the waters from your villa or sipping on cocktails while watching the sunset, you won’t be disappointed by what the Maldives have to offer. A resort island in Malaysia, Pangkor Island is less touristy and more under-the-radar than some of the other destinations on this list. But that doesn’t mean it’s any less beautiful. With several other neighbouring islands, it’s a great spot for island-hopping and snorkelling. 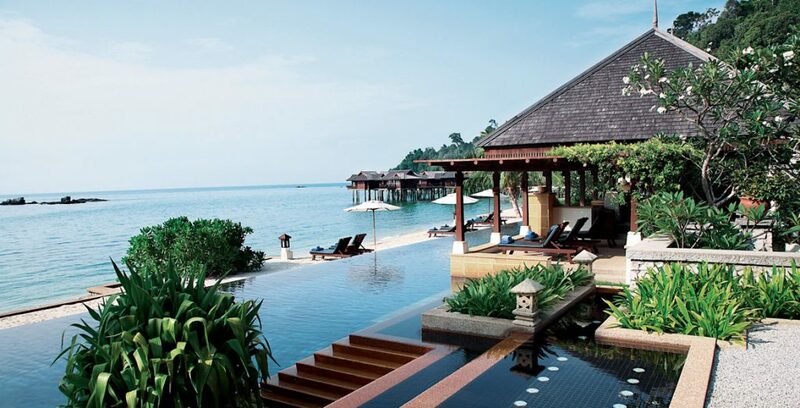 The Pangkor Laut Resort was previously voted ‘Number One in the World’ by Condé Nast Traveller, and is a scenic spot for a beach wedding or a honeymoon trip. 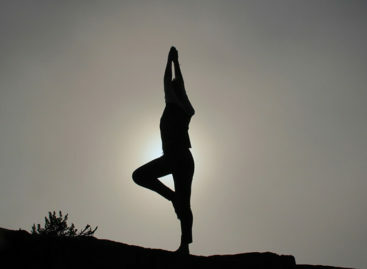 They do event planning to accommodate your special day, and also boast a rejuvenating spa village. There are many famed locations for a wedding photoshoot or a honeymoon in Singapore, and one of the best places is perhaps the iconic Marina Bay Sands, where you can admire the glittering cityscape at night. The Marina Bay Sands hotel provides top-notch service and luxurious suites, with access to the award-winning Banyan Tree spa and the famed infinity pool, where you can relax in the waters with a cocktail in hand, soaking in the view with your loved one by your side. 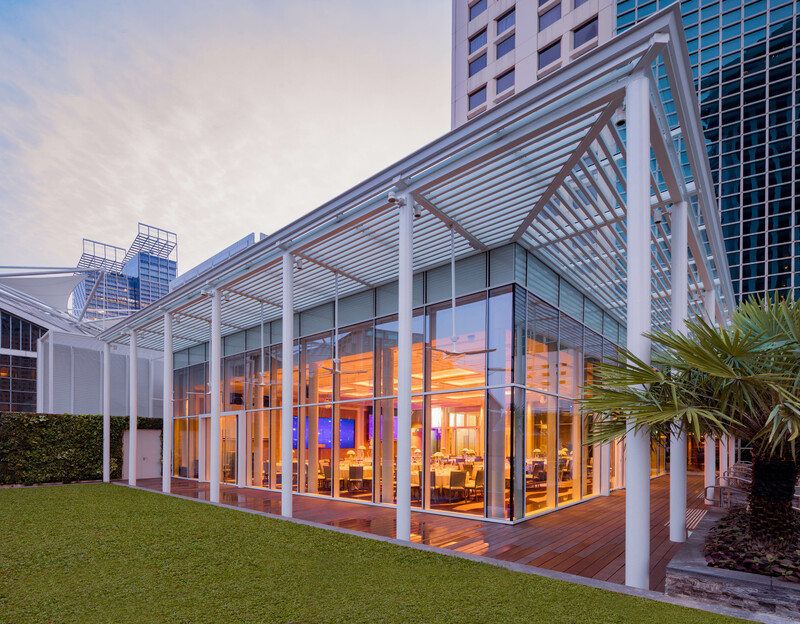 In 2018, the new pool Pavilion at the fully renovated Conrad Centennial has opened to wow guests with its glass-enclosed floor to ceiling design for an intimate wedding with up to 140 people. Larger weddings can also be hosted at the hotel’s ballroom. The wedding team can put together fabulous menus based on Golden Peony’s chef creations, the hotel’s signature Cantonese restaurant,, which offers dishes like . The wedding packages include a night at the fully refurbished Centennial Suites for a romantic and unforgettable night.